Van Raalte Hall was built in 1903 and served as the major administrative building of Hope College for over 70 years. The impressive red brick building was located at the south end of the pine grove along the former 12th street, just east of Dimnent Memorial Chapel. 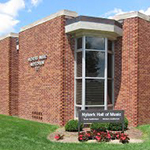 The hall held several classrooms used primarily by the humanities department, the original Kletz snack bar, and even a “museum” on the fourth floor. After functioning as a central part of campus life for several decades, the building began to fall into disrepair and was used primarily for administrative offices and the bookstore. 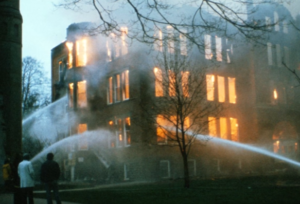 In the early morning of April 28, 1980, Van Raalte Hall was destroyed by a fire. 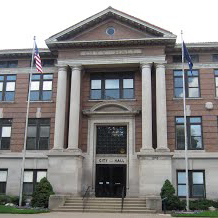 This documentary follows the stories of six people that were on campus at the time of the fire, including Dr. Stephen Hemenway, professor of English; Jon Huisken, dean for academic services and registrar emeritus; Tom Renner, retired as associate vice president of public and community relations; Dr. Gordon Van Wylen, who was president from 1972 to 1987; Dawn Van Ark, who is an acquisitions associate with the Van Wylen Library; and Dr. Kathleen Verduin, professor of English. “Shaped by flames” recounts their experiences of the building, the fire, and the aftermath and explores how campus life changed as a result while presenting an extensive photographic history of the event. This project was supported by the Hope College Department of Communication and the Joint Archives of Holland.